I didn’t get round to scheduling this post last month but Dividend Drive’s recent post reminded me this was still in draft form, so am posting this belatedly. Just over 12 months ago, I got caught up in all the hysteria around Neil Woodford setting up his own equity income fund and jumped onto the bandwagon with lots of other sheep investors. 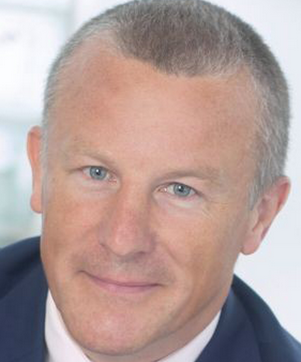 For those not aware, Woodford is considered a bit of an investing wizard in the UK – he previously managed the Invesco Perpetual High Income Fund, which was the best performing fund in the equity income sector, turning a £10,000 investment into £230,000 over 25 years. The CF Woodford Equity Income Fund is one of the few funds where the full portfolio of the fund is made public, instead of just the top ten or so with most other funds, it’s all quite transparent. It’s doing quite well it seems, easily beating both the FTSE All Share and IA UK Equity Income benchmarks over the same period (the figure includes dividends reinvested). 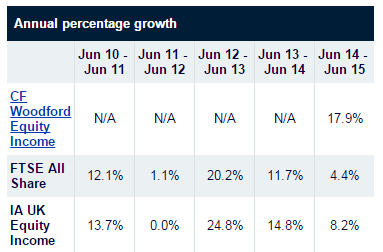 Of course, there’s no guarantee this kind of performance will continue but it looks pretty good right now. More info on how the fund has performed here. This fund represents 9% of my fund portfolio and is now my only actively managed fund. A year ago, actively managed funds made up around 86% of my portfolio – I’ve come a long way since then (and cut down on fees), thanks to Tim Hale’s book and Monevator! Once my portfolio gets closer to my targeted allocation, I may invest more in this fund. Woodford’s new investment trust, Woodford Patient Capital Trust plc is also on my watch list; when it becomes available as a regular investment on one of my platforms, I may consider chucking some money there too, although it’s trading at a pretty high premium of over 12% currently. Well done Weenie! Neil is a great manager, he has the track record to prove it. Let us know if you ever manage to get your mitts on the patient capital fund at a decent price! Thanks M! I shall continue to keep an eye on the Patient Capital fund and will update should I end up buying! I'm really liking DD's posts about Neil's latest buys/sells are useful too highlighting individual stocks to add to my buy list and hoping I can latch onto that track record! Thanks for linking to my post, weenie. Glad it reminded you to post this! I agree, Woodford is an excellent manager. It would be fascinating to know how much of that performance since starting is a result of his name more than his investments! Could probably get a gist of that from looking at how much his old funds dropped on his leaving! His Patient Capital Trust does very much attract me. I look forward to researching it more when I get the time. It is an area where, certainly, professional investors (especially talented ones) have an advantage over private investors. Here's to Woodford's performance continuing! You're welcome DD. Yes, I wonder too if the performance is as a result of his name but I don't really care, as long as it's going in the right direction! :-). Even the news of his buys and sells (which you kindly list, thanks for your hard work) must have an effect on those shares as people following his investing/selling actions.